A taco is perhaps the most delicious blank canvas I can think of. 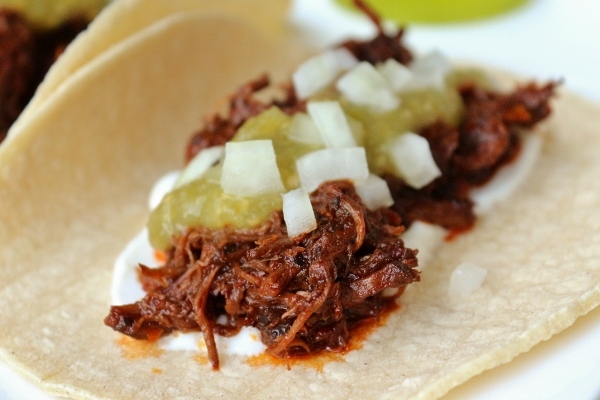 You start with a tortilla, traditionally a soft corn tortilla gently heated in a skillet to make it more pliable and enhance the flavor of the corn. You could easily opt for a flour tortilla, or a crunchy shell, but my favorite is always the tried and true (and more authentic) soft corn tortilla. I purchase mine at Trader Joe's. Then you have your filling which can range from vegetables, beans, scrambled eggs, any type of meat or even seafood. 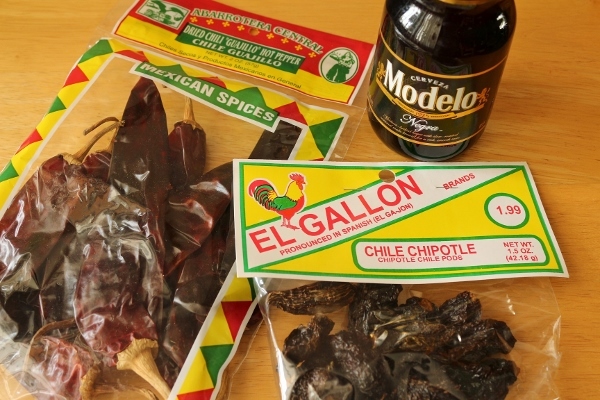 Inspiration for a taco filling can come from almost anywhere. I've made Buffalo chicken tacos so anything is fair game. 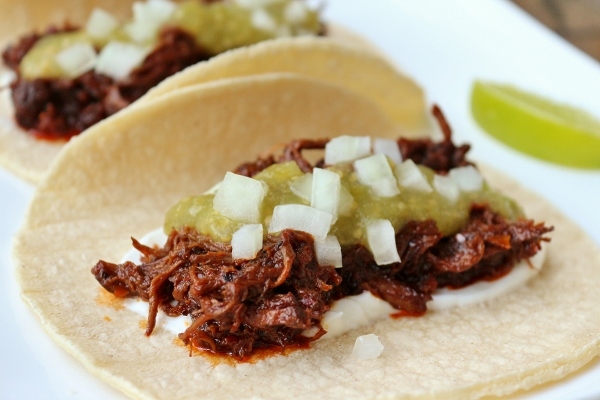 Last but not least, you finish off the taco with toppings, which can include a myriad of salsas, guacamole, sour cream, chopped onion, cilantro, cheese, and more. 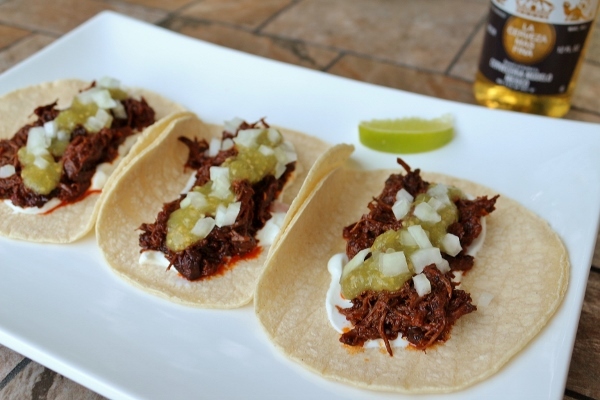 The magic occurs when all of these flavors are wrapped up together into a single bite, and it truly feels like magic with tacos as good as these. 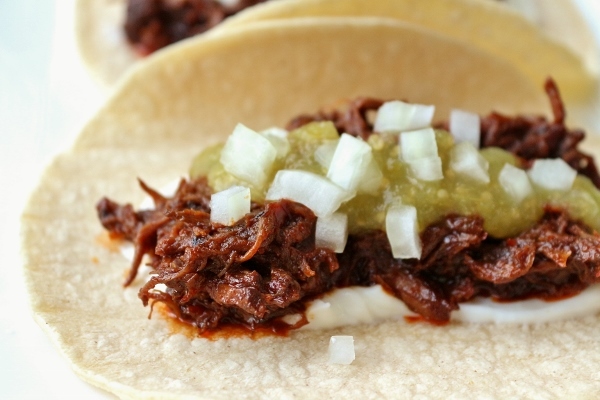 This Guajillo-Braised Short Rib filling is outstanding. The flavors are complex and fairly spicy, while the texture is unctuous and so melt-in-your-mouth tender! 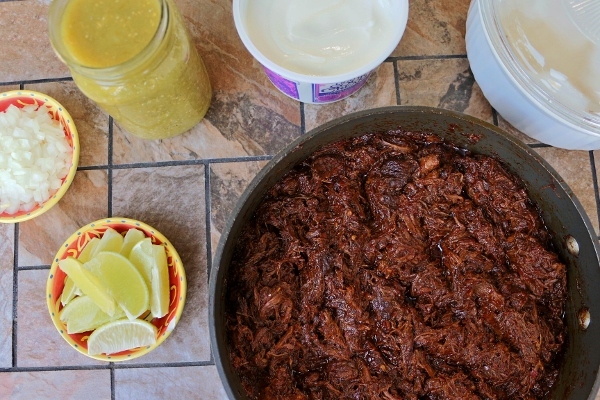 The braising liquid consists of a mixture of toasted guajillo and chipotle chiles, onion, garlic, cumin, Mexican oregano, and dark Mexican beer. I was supremely neurotic when shredding my short ribs and removed every speck of gooey fat because I seriously hate that texture, and didn't want anything distracting me from enjoying these perfectly braised short ribs. It's worth the extra effort in my opinion rather than just hastily shredding away. You owe it to yourself after waiting hours for them to finish cooking. This filling was actually prepared weeks in advance of a recent game night I hosted! It freezes, thaws, and reheats beautifully, making this a wonderful idea for a make ahead party dish or even a weeknight meal (Did someone say "Taco Tuesday?" Oh yeah, that was me). 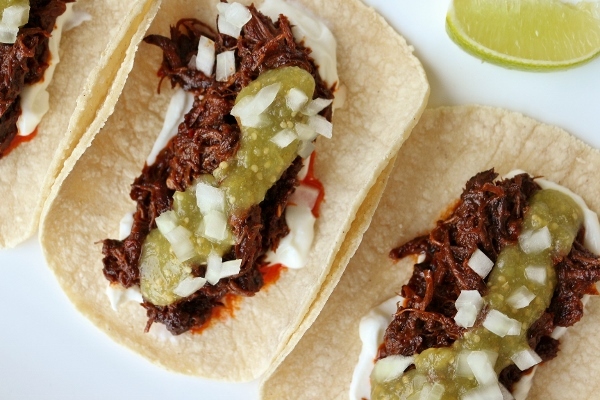 These Guajillo-Braised Short Ribs are seriously epic in terms of taco fillings. I can't stress enough how amazingly delicious they are! Like I said earlier, they are on the spicy side, so I made sure to serve them with some sour cream to cool them down, some chopped onion for crunch, as well as a slightly mild homemade salsa verde. I boiled about 1 pound tomatillos with 2 stemmed, halved and seeded jalapenos (normally I leave the jalapenos whole with the seeds in there but wanted to cut a bit of the spice since the filling was already pretty spicy), about 1/2 a large roughly chopped onion, and a couple peeled garlic cloves, then drained and pureed in a blender with some salt and ground coriander since I didn't have fresh cilantro on hand. The salsa verde received rave reviews all night, with threats to drink the remainder straight from the jar. If you manage to have leftovers of this filling (hint: you won't! ), it would be extraordinary on top of nachos as well, and with football season officially starting, I can't think of a better way to wrangle your friends to celebrate all the occasions worth celebrating! Working in two batches if necessary to avoid crowding, lightly toast all of the chiles in a dry, heavy skillet over medium heat for 30 seconds on each side, until fragrant but not blackened. Set them aside on a plate. Heat 2 tablespoons of the oil in a Dutch oven or other heavy pot with a lid over medium-high heat. When the oil is hot, working in batches to avoid crowding, add the meat and sear for about 3 minutes on each side, until the pieces have formed a uniformly browned crust. Add more oil to the pot as needed to prevent scorching. As the pieces are ready, set them aside on a plate. Add the onion to the same same pot over medium heat and cook, stirring occasionally, for about 5 minutes, until it starts to brown. Add the garlic and cook for an additional 2 minutes. 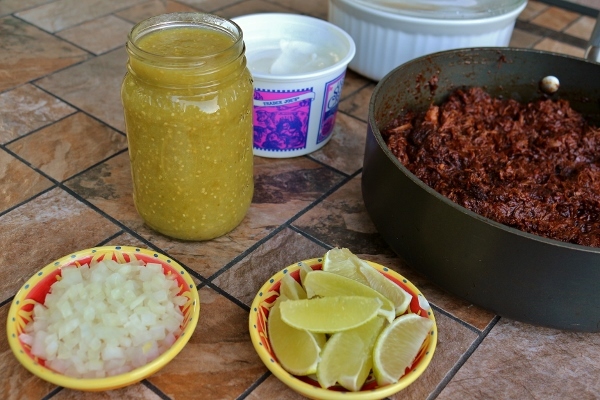 Pour in the beer, add the toasted chiles, and turn down the heat to low. 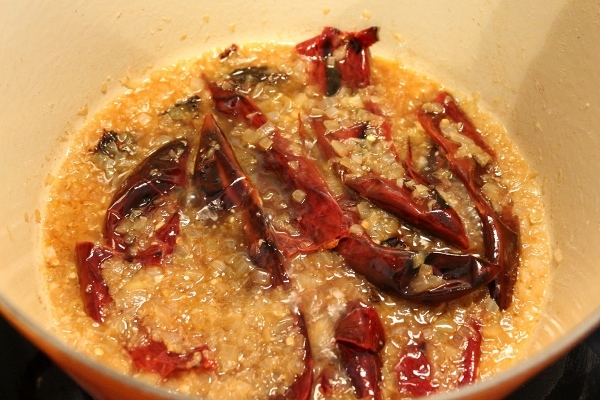 Simmer uncovered, stirring occasionally, for about 5 minutes, until the chiles have softened and are pliable. Remove from the heat and let cool. Transfer the contents of the pot to a blender and reserve the pot. 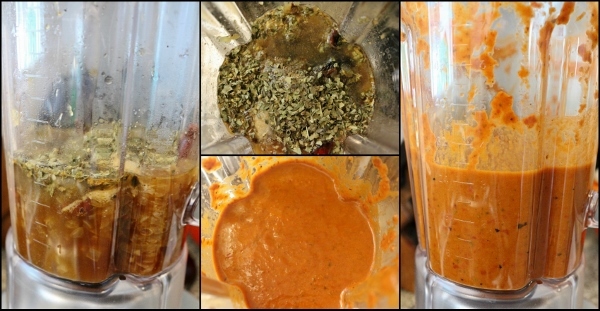 Add the cumin, pepper, oregano, salt, and water to the blender and blend the mixture on high speed until smooth and the consistency of cream, adding more water if needed to thin the mixture a bit. Return the seared meat to the pot and pour in the chile mixture. 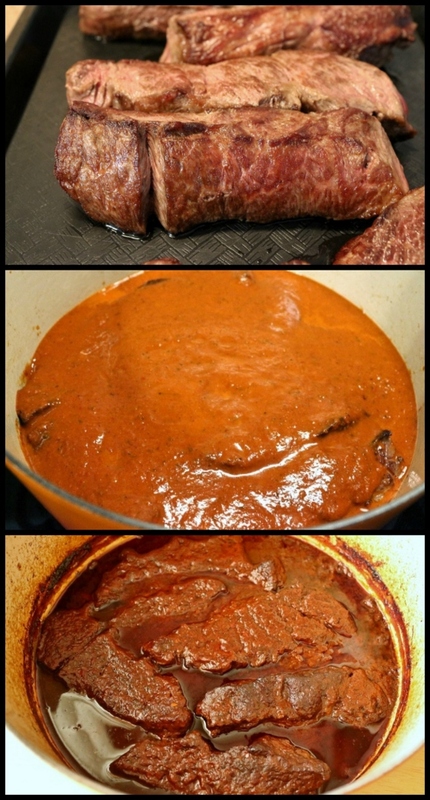 Cover, transfer to the oven, and cook, stirring occasionally, for 3 to 4 hours, until the meat is fork-tender. 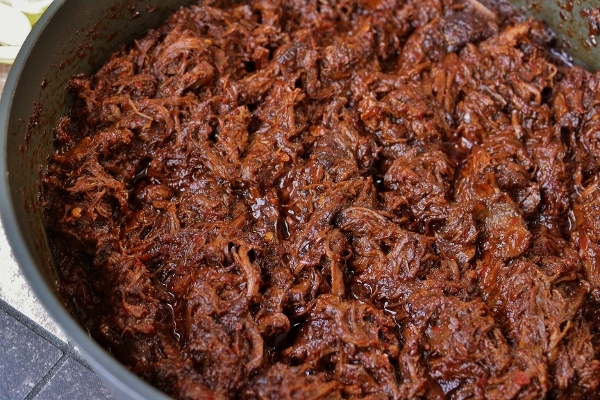 Remove from the oven and, using tongs or a couple of forks, shred the meat in the pot. Taste and adjust the seasoning with salt if needed. 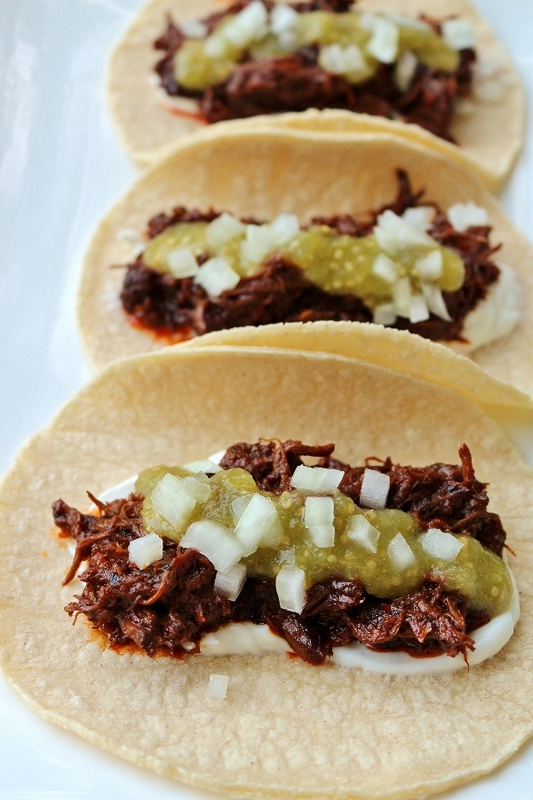 Serve with the tortillas, onion, cilantro, salsa, and lime. *Note* You can ask your butcher to bone the ribs for you, or you can just cook them with the bone in and then bone them before shredding the meat. You'll need 5 pounds of bone-in short ribs to yield the required 3 pounds of meat. This dish can be on the spicy side, so if you're really sensitive to heat, cut back a little on the chiles.